Mini Pizza Boxes are Amazing!!! These Mini Pizza Boxes are precious and decorating them is so simple! 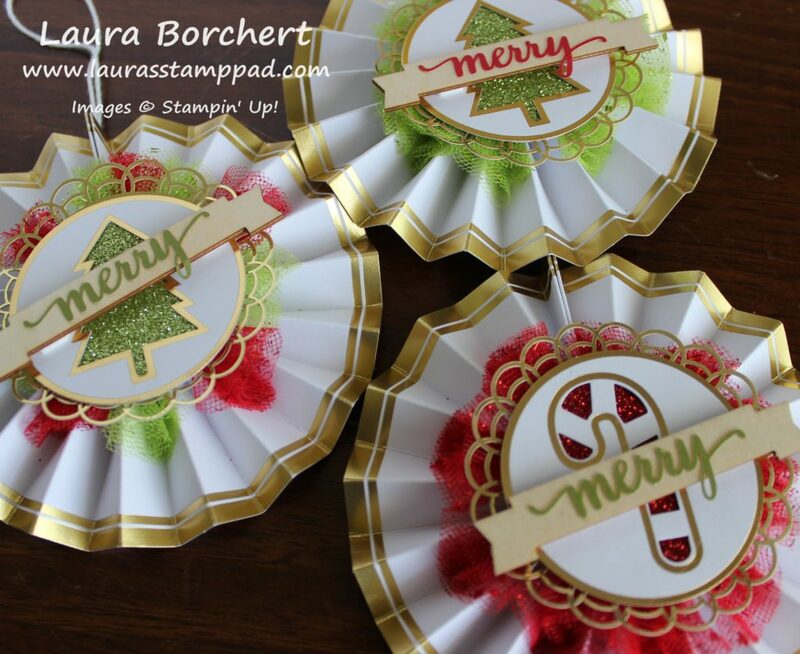 You can either just decorate the top square or wrap ribbon all around or do a belly band! I folded the little Pizza Box on the score lines and popped it together. Be sure the shiny, plastic side is on the inside. This is to make it food safe! Next I added a piece of Merry Little Christmas Designer Series Paper. 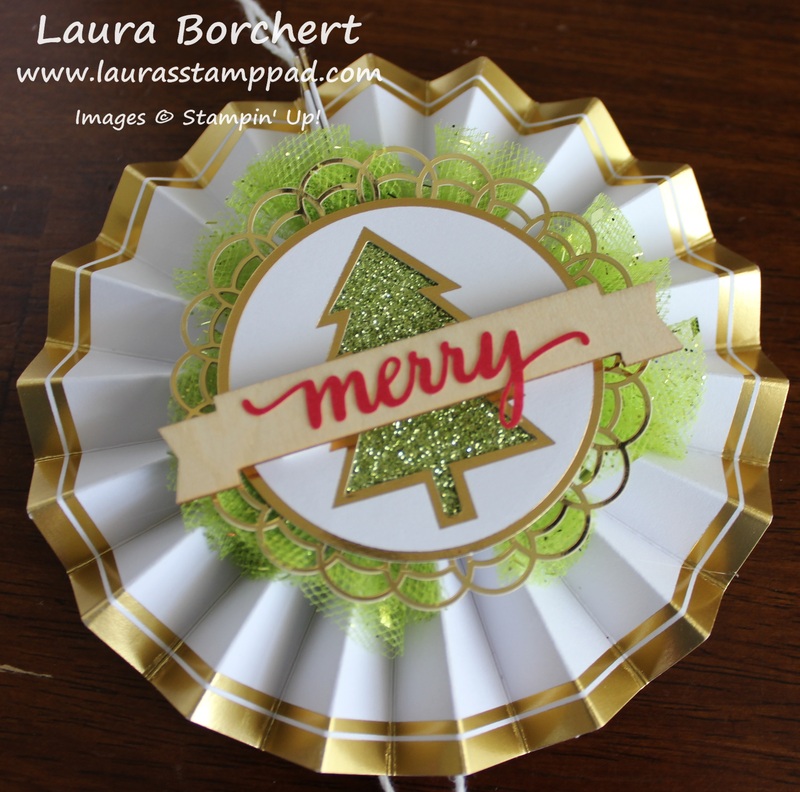 Then I placed one of the gold Foil Snowflakes in the center. 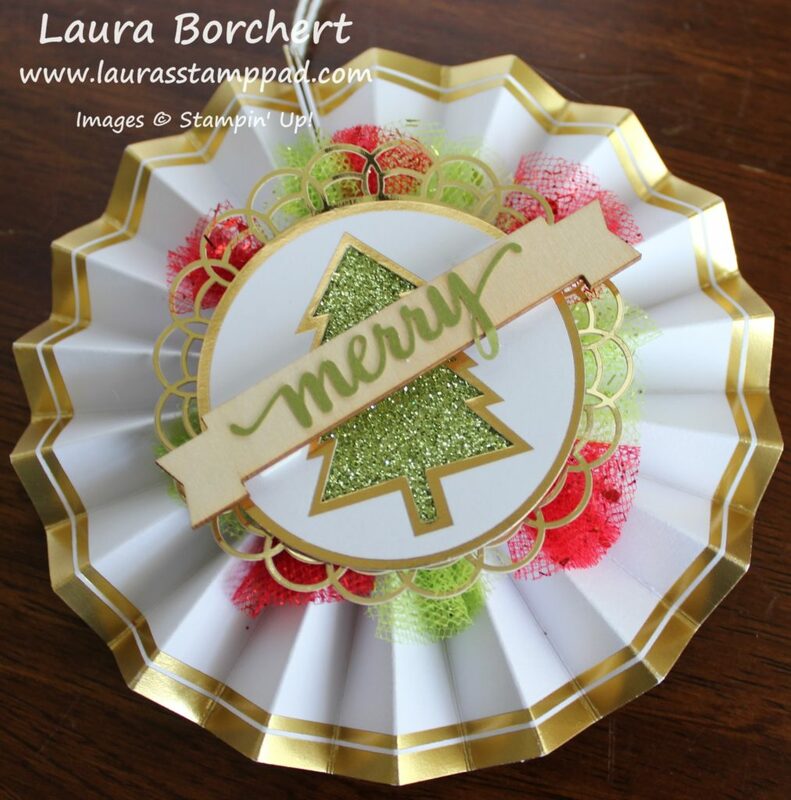 For the greeting, I used the Layering Ovals Framelits and Stitched Shapes! I love layering these 2 styles together. They are just fabulous! 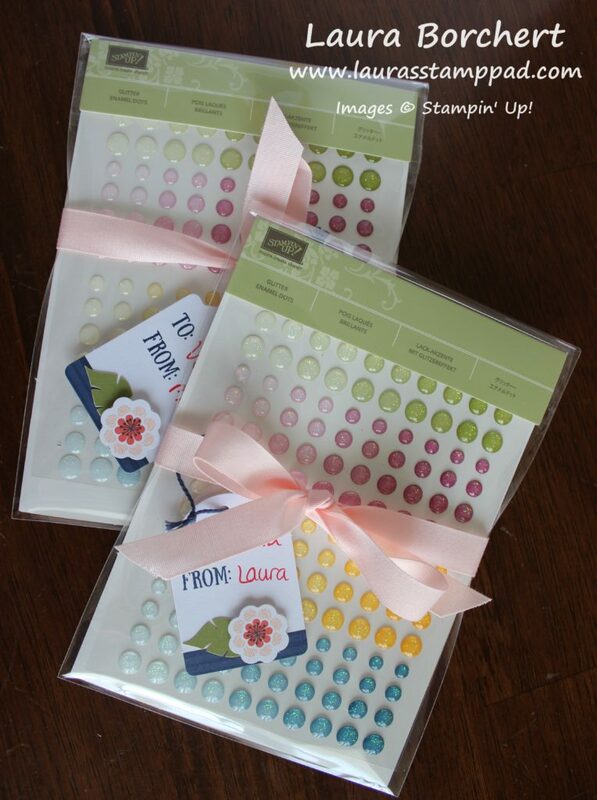 The greeting was stamped in the middle from the Merry Little Labels Stamp Set! There are lots of great greetings in that set to pick from! 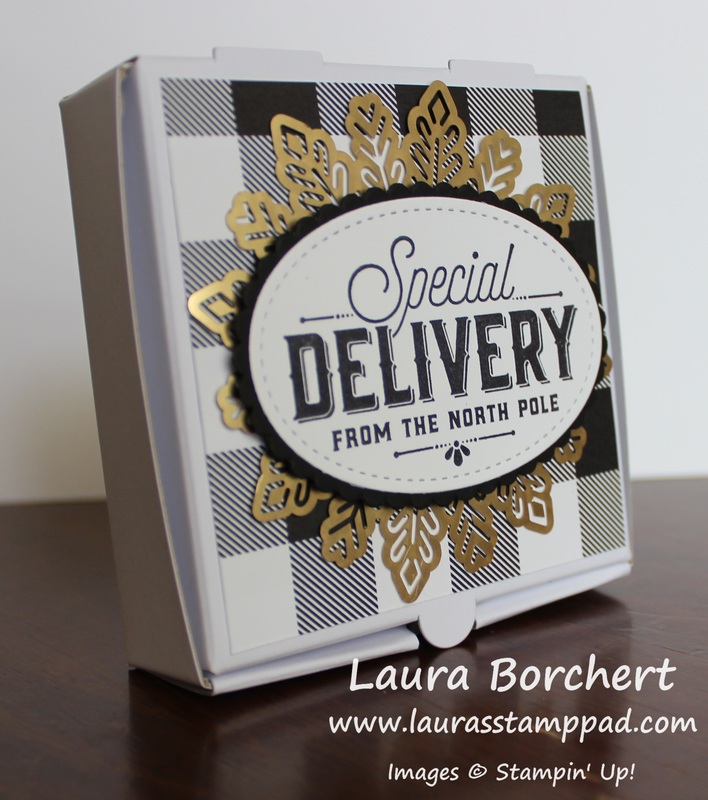 I added the greeting to the box with Stampin’ Dimensionals! Simple switch out the Designer Series Paper and the greeting and this would be perfect for any occasion! 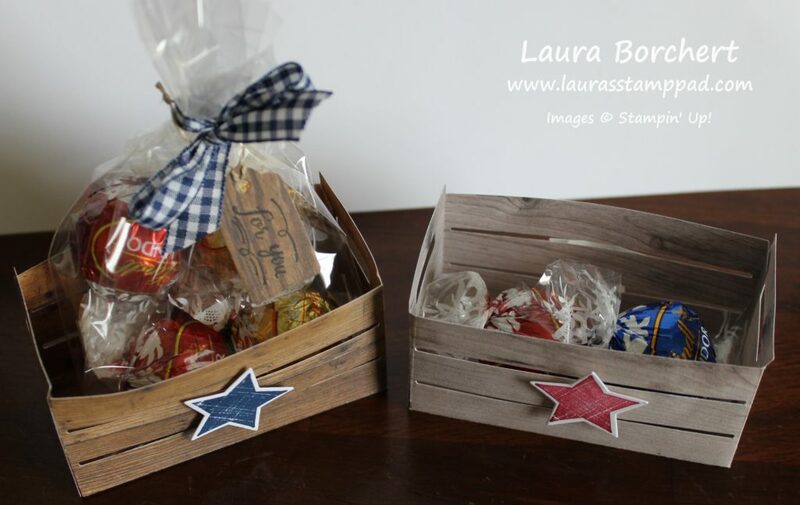 Check out other fabulous gift packaging idea in yesterdays post! There is a video tutorial as well! 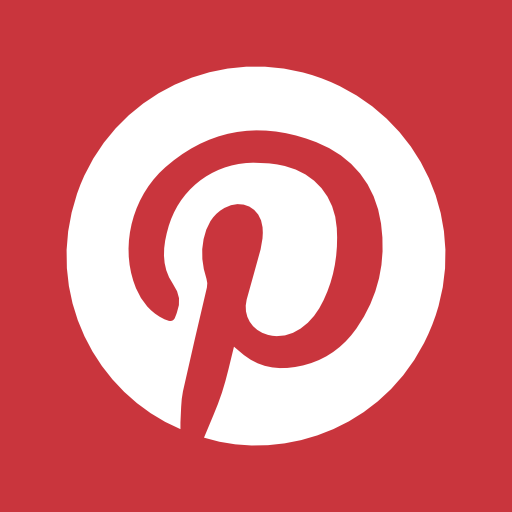 Technique Tuesday – Treat Tubes For Every Occasion! Happy Tuesday!! That means I have a fabulous technique to share with you!!! 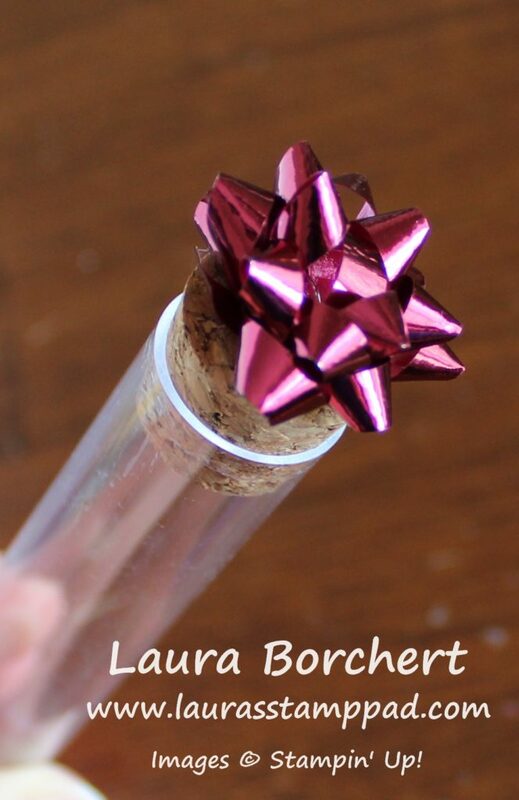 Today, I’m showing you these fabulous Treat Tubes from the Holiday Mini Catalog!!! 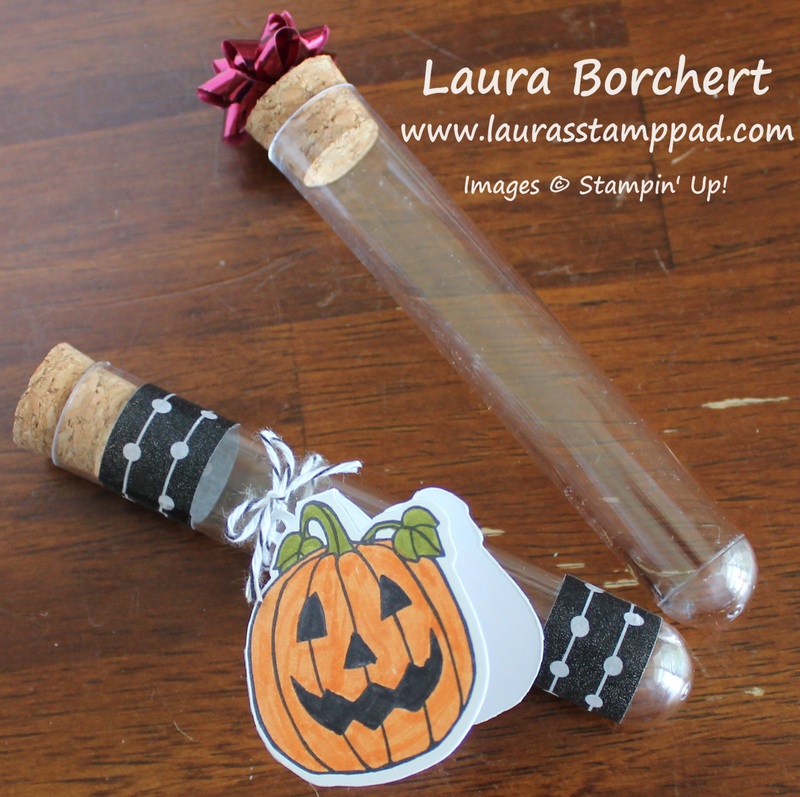 Here are 2 tubes that I decorated for Halloween and Christmas. Well actually that little red bow could be any occasion….like Valentine’s Day, Birthday, Baby, etc. That is what is so fun about these! They are cute, simple, and fun! For the little Pumpkin one, I used some of the Pick A Pattern Designer Washi Tape to wrap around the top and bottom. 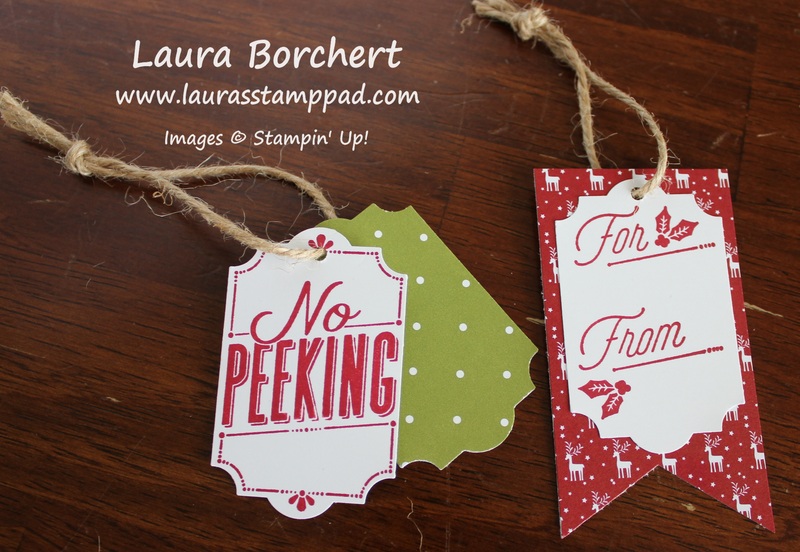 For the tag, I used the Seasonal Chums Stamp Set and coordinating Seasonal Tags Framelits (Bundle and Save 10%). I simply stamped it in Basic Black Archival Ink so it wouldn’t bleed when I colored it with the markers. I wanted that bold, bright color so I went with markers. Pumpkin Pie, Old Olive, and Basic Black were the colors I used! I love this set because it makes perfect little tags with the hole in it to tie it on and it’s a front and back tag. Isn’t that adorable??? I used Black and White Baker’s Twine to tie it on! I went super simple with this one and placed a Mini Bow on top! Adorable!!! You could always add a tag if you wished! A few tips for the inside goodies: Candy, Tic Tacs, M&Ms, Hot Cocoa, Coffee Beans, Single Serving Drink Packets (coffee, tea, lemonade, etc. ), Bath Salts, Candles/Balloons/Confetti, Spice Mix, Glitter, Oats & Glitter for Reindeer Food, Marshmallows inside tied to a Hot Cocoa Packet. Let me know in the comments if you have any other great ideas!!! 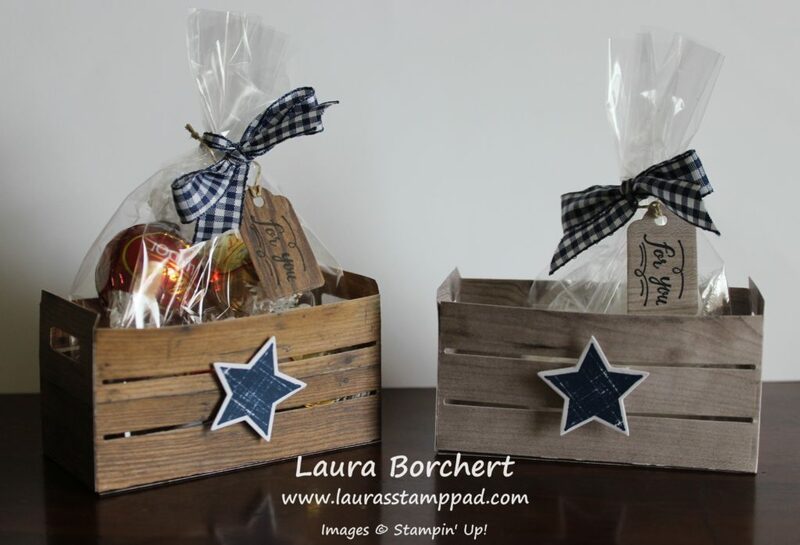 If you would like to see these in action and lots of other Gift Packaging ideas, check out the Video Tutorial below. I will be posting more items from the video on here tomorrow so stay tuned! Be sure to give the video a thumbs up if you liked it and don’t forget to subscribe if you are new. If you would like a notification when I post a new video, be sure to click the bell right next to the subscribe!!! 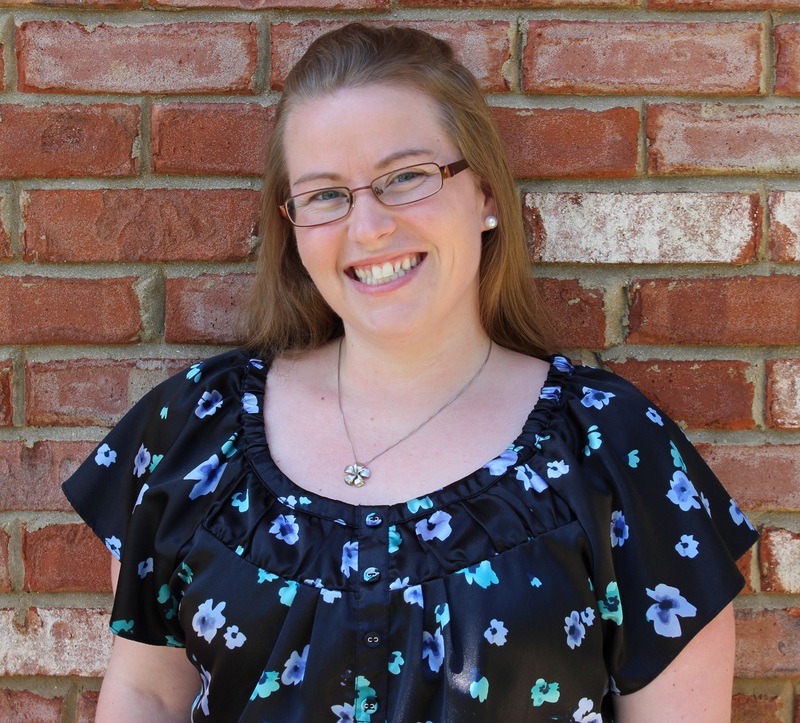 We celebrate on Fridays because…..why not? We survived the week and made it to another weekend! For some that means relaxing and spending time stamping and for others that means enjoying the weather and spending time with family. What’s even better is when all of those things collide! Either way, we have a lot to celebrate!!! 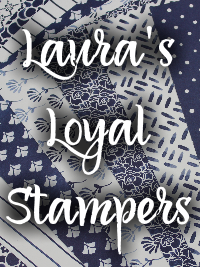 First, we have the August Laura’s Loyal Stampers Stickers!!! This is my reward program for all of my customers. 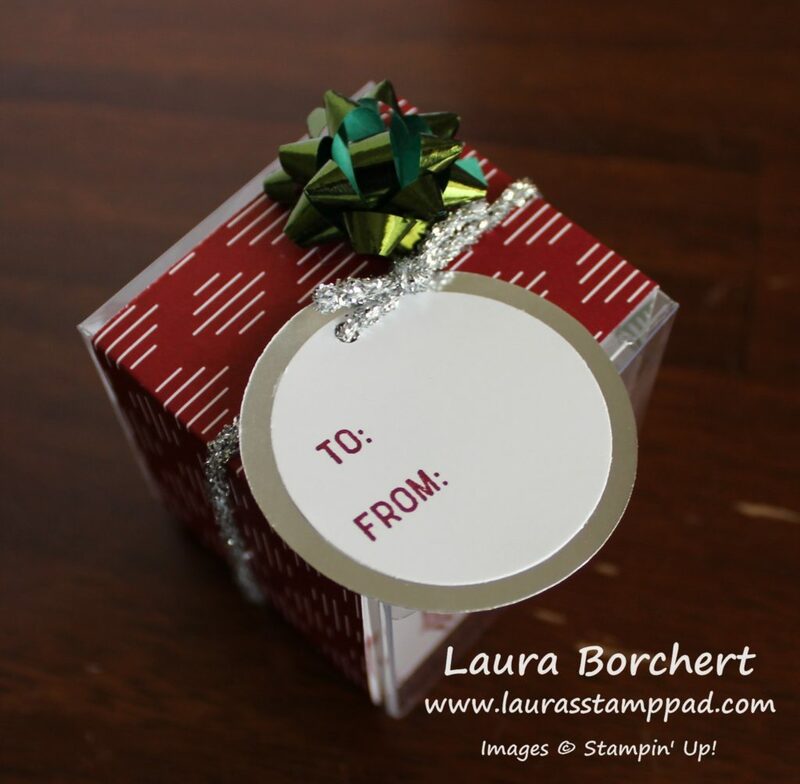 I love giving back to those who love Stampin’ Up! as much as me. For every $40 order, you will receive a sticker and after 10 Stickers you get a $40 Gift Certificate. It doesn’t matter if it takes you 4 years or 4 months to earn this. I do all of the tracking for you! Just shop, earn, and enjoy!!! 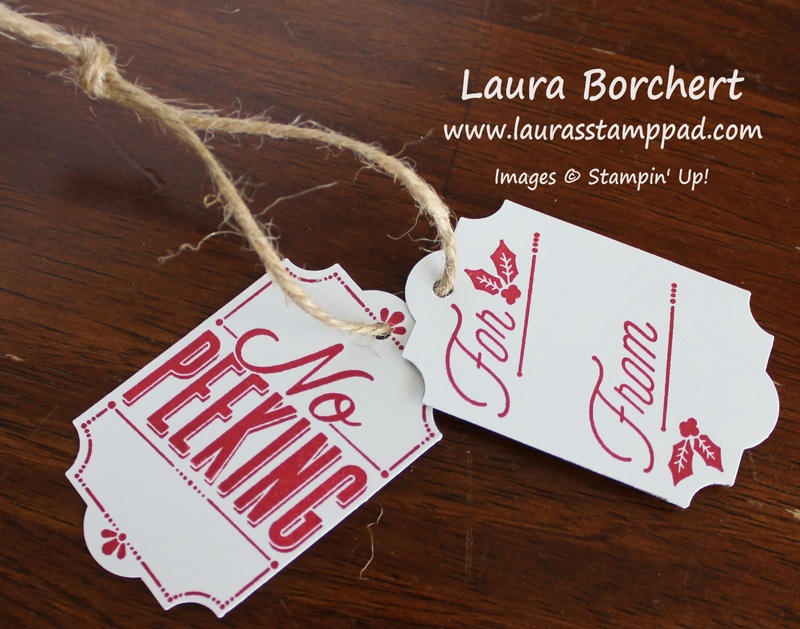 Who else is loving those adorable little tags from the August Paper Pumpkin Kit??? I sure am! These have gone on lots of treats I’ve given out lately. 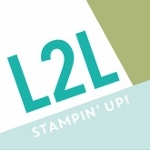 I did a little Challenge for my Fabulous Friends Stamp Team and wrapped up their prizes! Also, I used them for some of the prizes from the Virtual Girls Night Out Holiday Mini Catalog Party that I did on my Facebook Page earlier this week! It was so much fun and I hope everyone else enjoyed it as much as me. Happy Birthday to ME!!! Let Us All Celebrate! Today’s MY BIRTHDAY!!!! Let Us All Celebrate together with some fabulous specials!!! Are you ready for all of this fabulous-ness!?!?!? 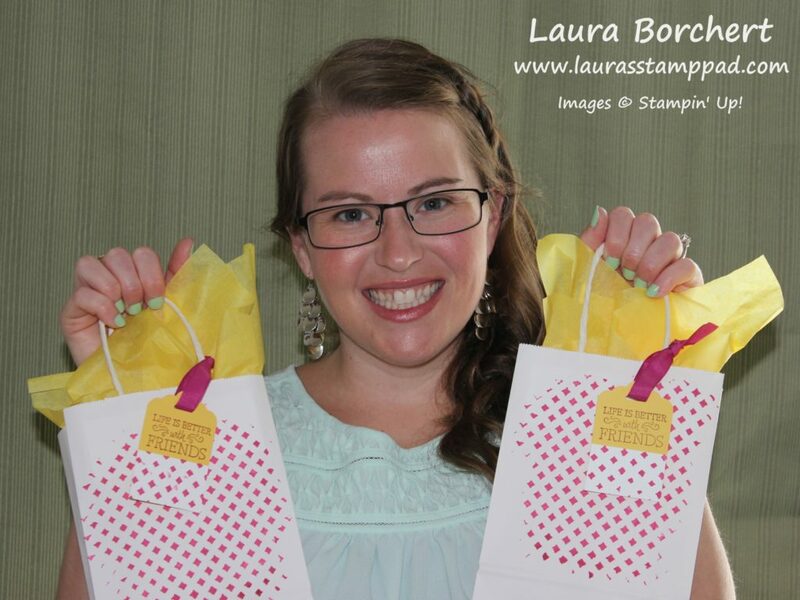 TODAY ONLY…..every order of $40 (before tax and shipping) will earn a FREE Gift from me as well as 1 Laura’s Loyal Stampers Stickers! 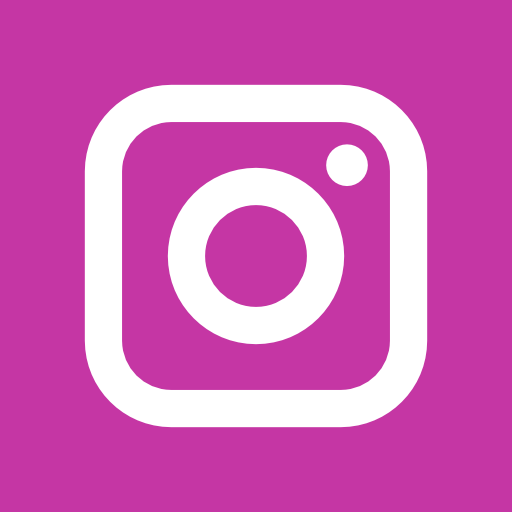 I have tons of great prizes to give! Check them out! Click here to start shopping and enter the Hostess Code: A3AR6VYH when you are checking out!!! 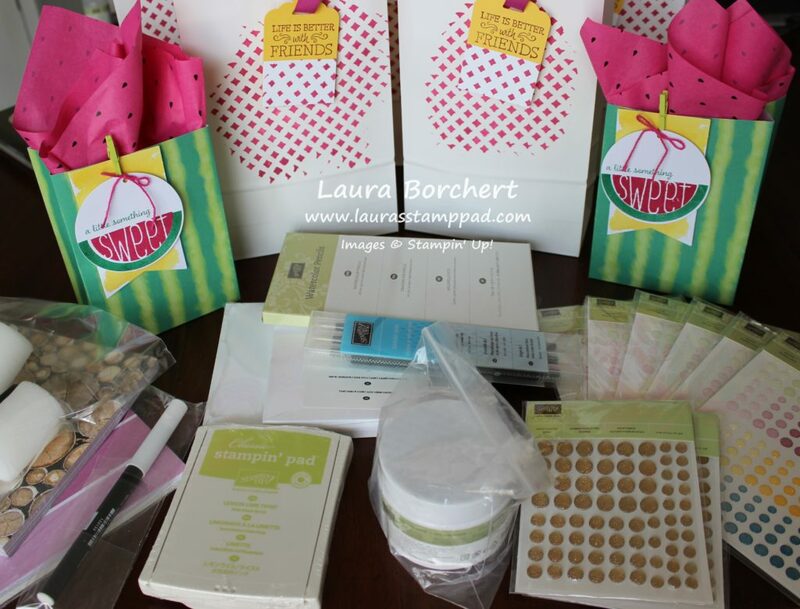 Here are just a few of the goodies – Embossing Paste, Blender Pens, Ink Pads, Glitter Enamel Dots, Chalk Marker, Designer Series Paper Stacks, and more! 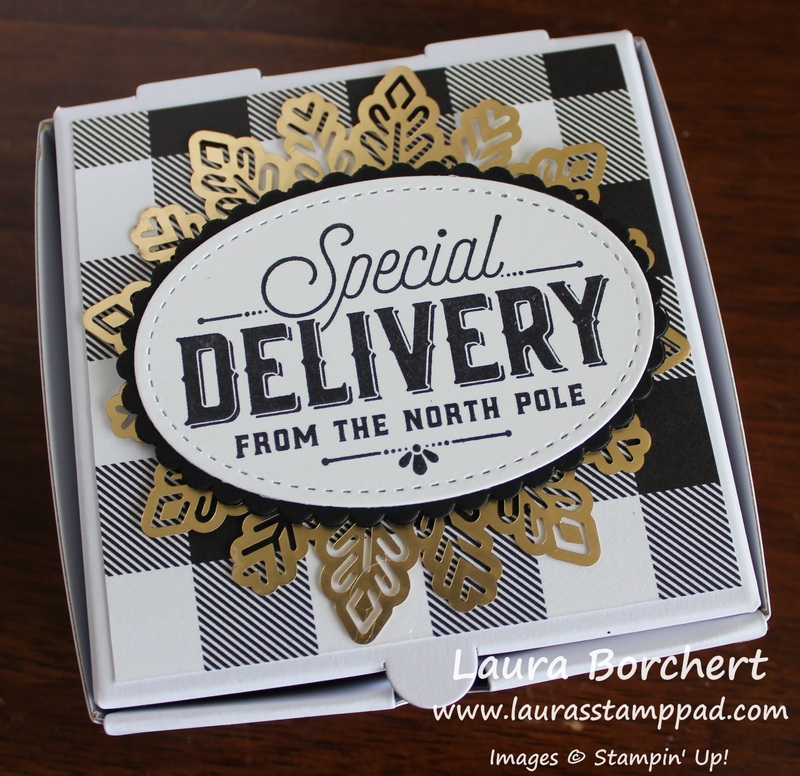 But wait there’s more……If you order $75 (before shipping and tax), you will get a Free Gift, One Laura’s Loyal Stampers Stickers, AND the Smitten Mittens Stamp Set for Free! 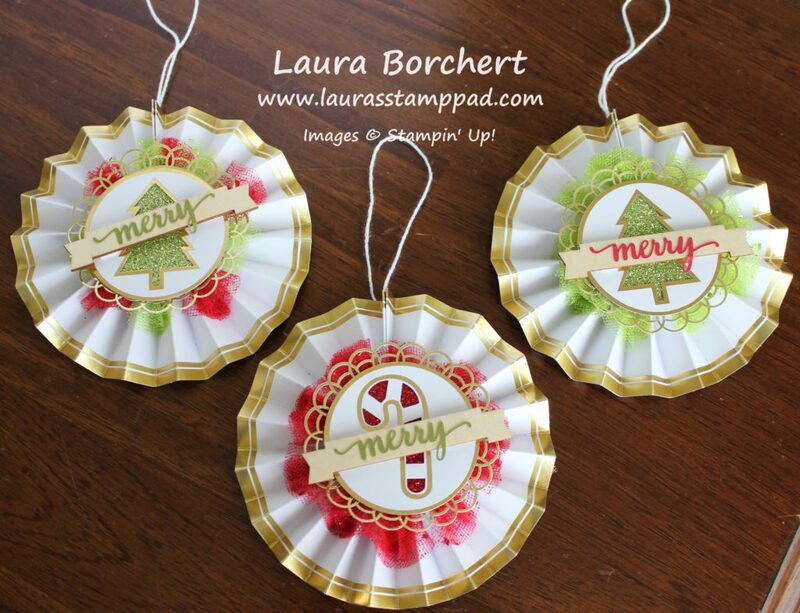 This set is coming out in the Holiday Mini Catalog so you can earn it before it even comes out! Woot Woot! Click here to start shopping and enter the Hostess Code: A3AR6VYH when you are checking out!!! Not sure what to order or just getting started with stamping or just want to check it out……Paper Pumpkin is HALF PRICE for September for new subscribers. 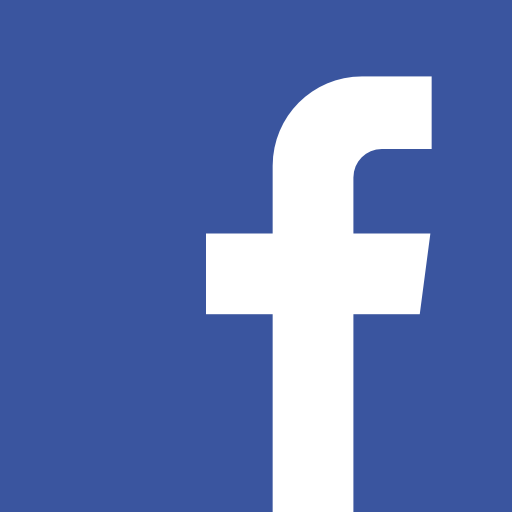 Click here to sign up and use the Promo Code: HALFOFF0917 (zero nine one seven). If you sign up TODAY, you will earn a Free Gift as well! 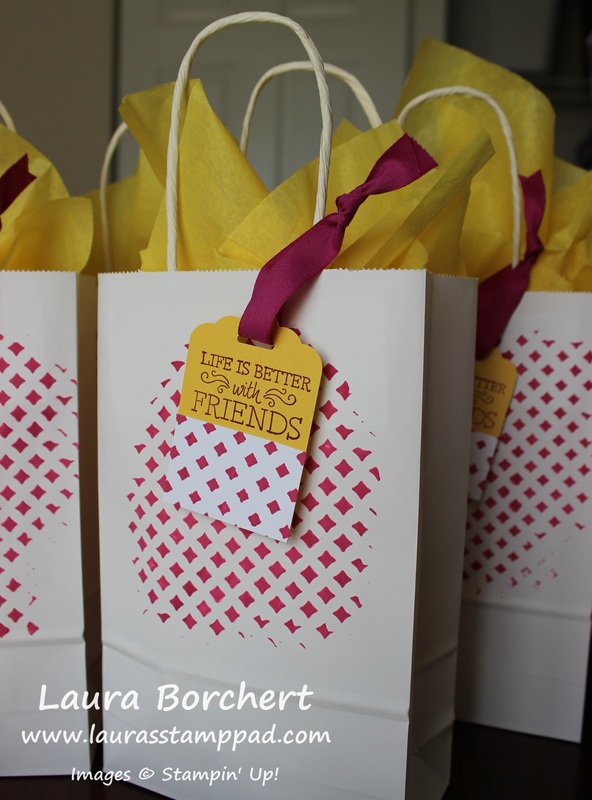 These gift bags were super fun to make with Embossing Paste! I got them at the dollar store, smeared some embossing paste over the template randomly. Since I had a ton of Berry Burst paste left over, I just did it over tons of scraps. Once it was all dry, I added those scraps to some tags and added the tag to the bags with Finely Woven Ribbon! I love how they turned out! If you would like to see these items and ME, check out the Video Tutorial below or click here! Be sure to give the video a thumbs up if you liked it and don’t forget to subscribe if you are new. 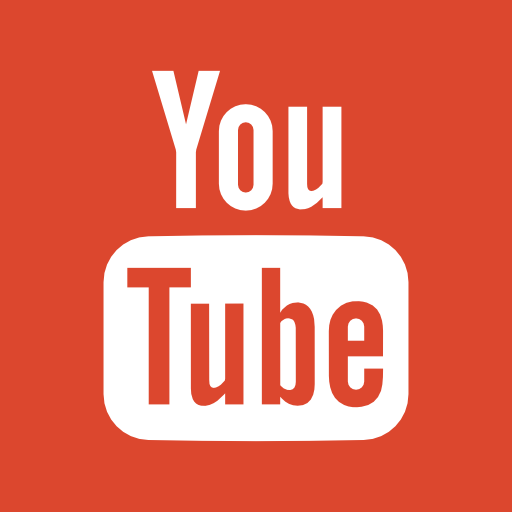 If you would like a notification when I post a new video, be sure to click the bell right next to the subscribe!!! 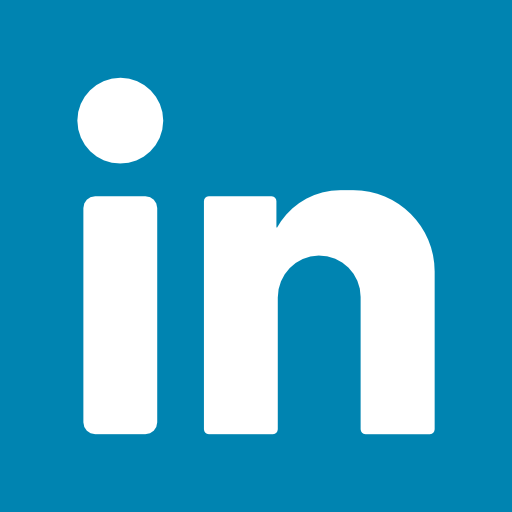 Technique Tuesday – Wooden Crate of Chocolate!!! Happy Tuesday!!! You all know that means I have a fabulous technique to share and this one is a wooden crate of chocolate!!! YUM! Aren’t these adorable and super real looking with that Wood Textures Designer Series Paper??? The Wood Textures Designer Series Paper comes in a 6″ x 6″ Stack and both sides of the paper are the same pattern. This is perfect so that the inside of your box looks the same. I love that! I die cut out 2 of the box dies from the Wood Crate Framelits to create the box. This requires 2 sheets of the Designer Paper but don’t worry we will be using the leftovers. 🙂 Using some of those leftover pieces, I die cut out the little tag for the treat bag. Now for assembling the box, I scored on all of the lines and added Tear and Tape to the side and bottom tabs. I prefer Tear and Tape for this because you can apply it to the box in advance. Then reveal it as you need it without having sticky tabs in your way! Another tip for assembling the box is to press it flat to the tab rather that doing it in the air. This will make for a more square/even box and it won’t be off set. For the decorations, I stamped the star from the Wood Words Stamp Set in Night of Navy and Real Red. 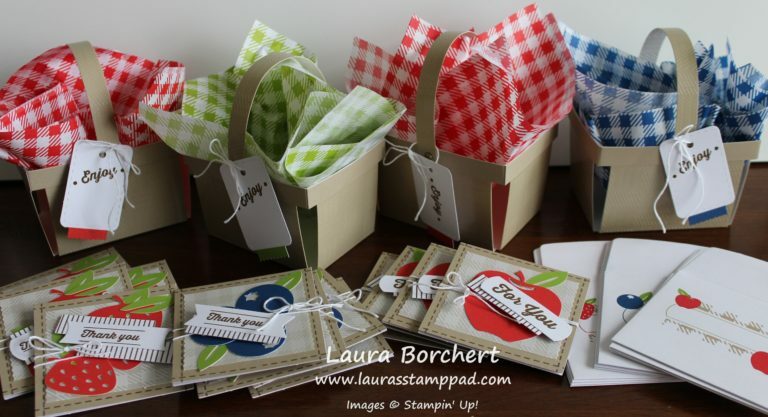 Using the Wood Crate Framelit, I die cut them out and placed them on either side with Mini Stampin’ Dimensionals. (Bundle & Save 10%) I wanted to make sure the sticky wasn’t peaking through the slats. 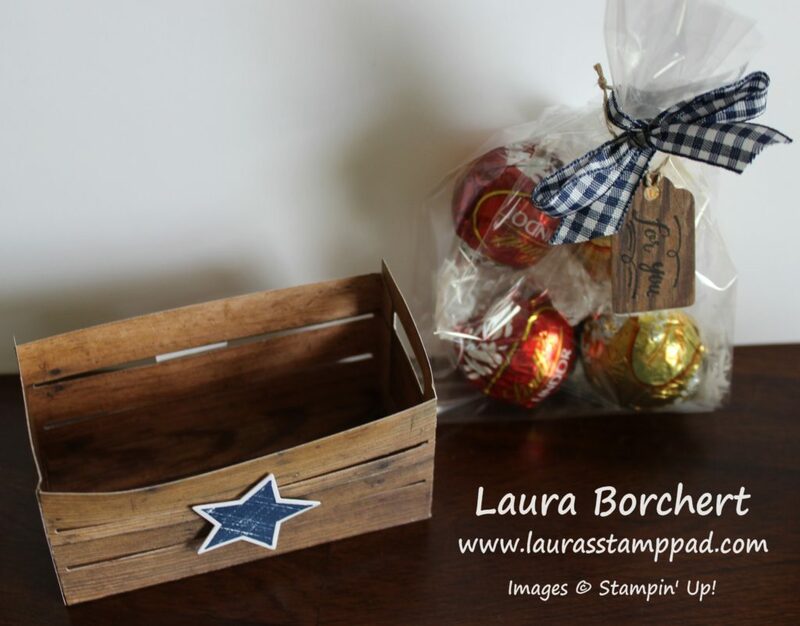 Now for the chocolate, I placed it into a 3″ x 6″ Gusseted Cellophane Bag and tied it up with some Night of Navy Gingham Ribbon. Next, I stamped the greeting onto the little tag and tied it around with Linen Thread. All of this rustic look is just precious! As you can see, 2 of the Lindor Truffle Chocolates fit perfectly on the bottom of the box. These could be sitting on a table for guests to enjoy or wrapped with as a little treat! Stay tuned to see how I use the leftover pieces to create a flat crate on a card. I’ll be posting that on Thursday!!! 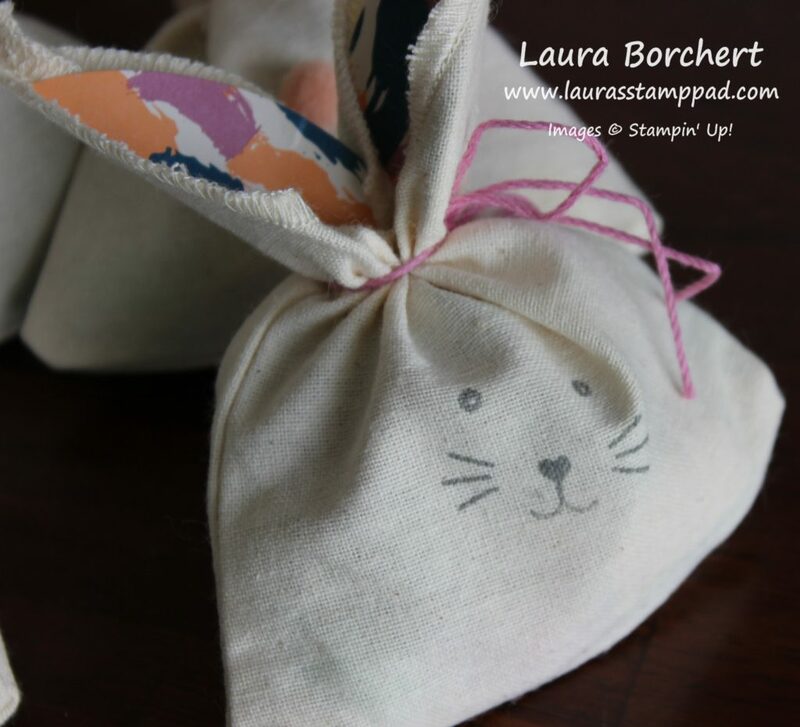 March 2017 Paper Pumpkin – Bunny Buddies!!! You all know I LOVE Paper Pumpkin because of the fun surprise each month. 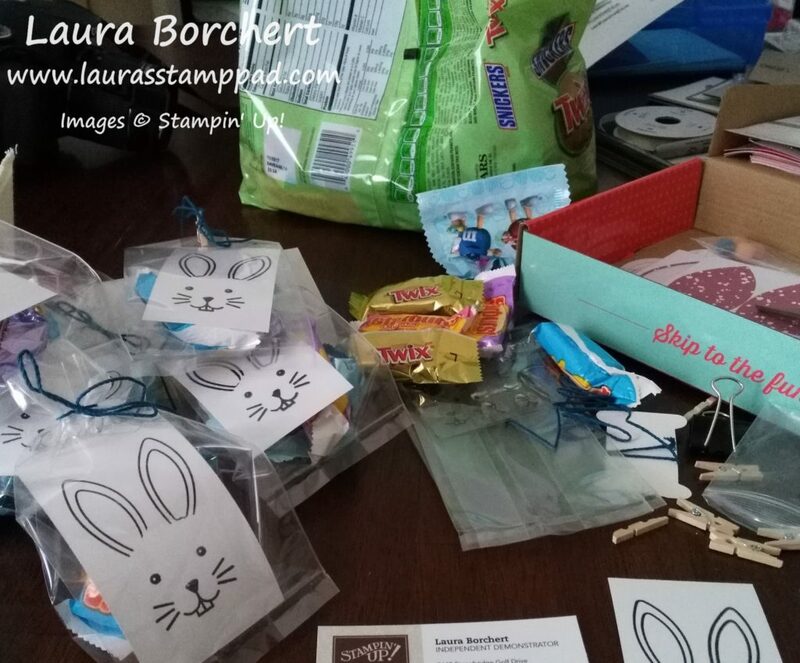 The March 2017 Kit – Bunny Buddies is soooo amazing! Even more than I originally thought…..look at everything I made!!! Don’t forget today is the last day to sign up for the April Kit! There is a free gift in there to celebrate Paper Pumpkin’s 4th Birthday! I can’t wait to see what it is!!! Click here to sign up TODAY to get the April kit! The kit came with all these amazing goodies to make 9 treat bags and 9 mini cards with envelopes. 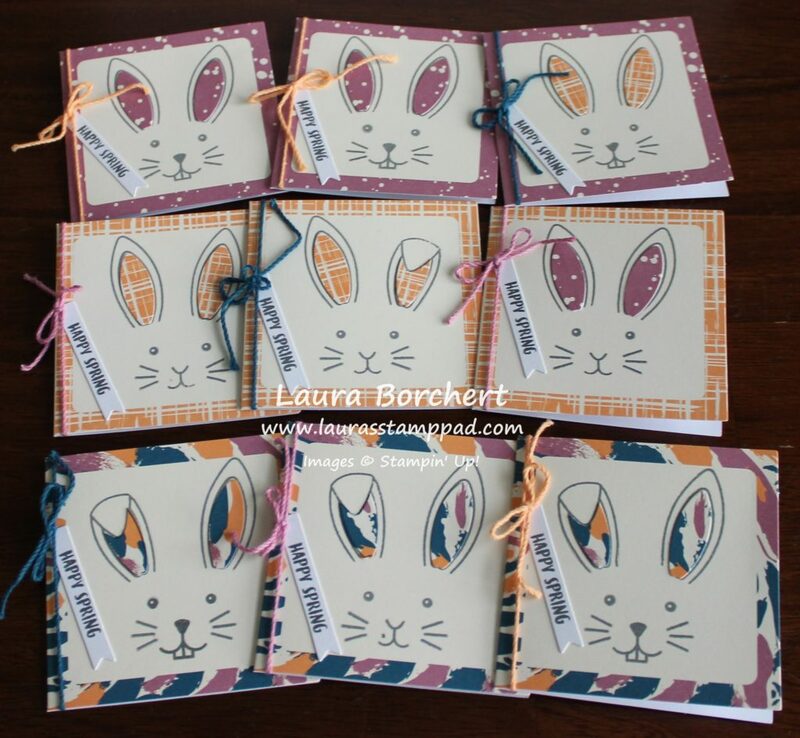 Bunnies are the theme which is perfect for Easter and Spring. The stamp set had lots of fun greetings so you could mix it up. Check out the reveal of the kit here! 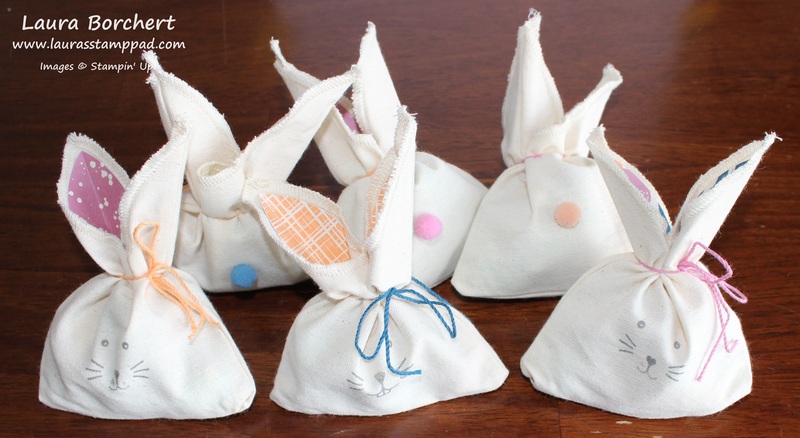 I made the 9 little bags for my nieces and nephews with candy inside! I didn’t add the little clothespin and greeting because I figured they wouldn’t care or even notice. 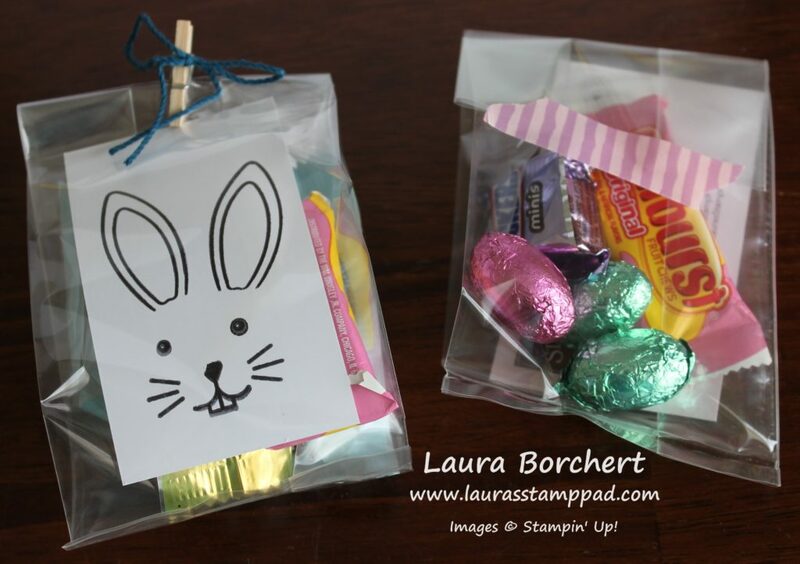 Then because I bought the biggest bag of candy possible and couldn’t resist wanting to eat it all, I thought I would make more treat bags using others I had on hand! 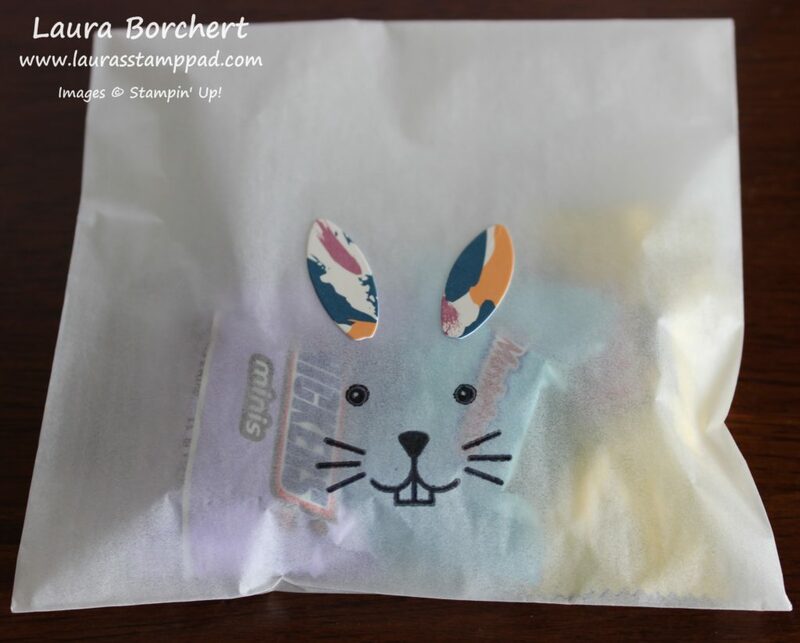 Next, I used the small Gusseted Cellophane Bags, added some candy and stamped the bunny face! I used up the clothespins with some of the Baker’s Twine tied around it and when I ran out of those I used some Playful Palette Washi Tape. These were so simple and quick to create! I love them! When I ran out of the gusseted bags, I used a few of the Glassine Gift Bags I had. I just stamped right onto the bag and used some leftover bunny ear stickers! The March Kit is my favorite one of the year so far; love it!!! I can’t believe how much I was able to create with the products in this kit and the stamp set! I love how Paper Pumpkin comes with enough to complete the kit as well as extras to use on other projects! Don’t forget today is the last day to sign up for the April Kit! 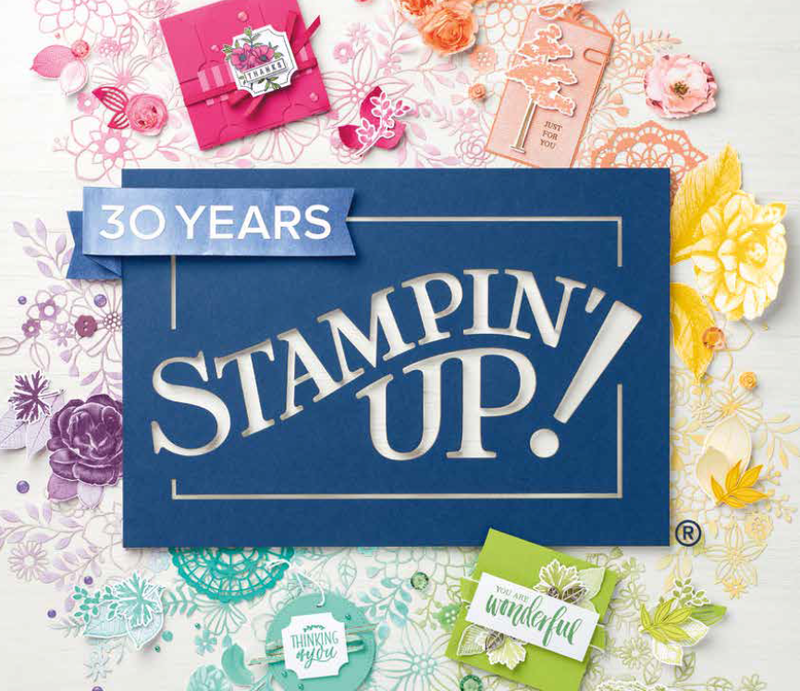 It is going to a fabulous one since Sara Douglas, Stampin’ Up CEO created it AND there is a free gift in there to celebrate Paper Pumpkin’s 4th Birthday! WOOT WOOT! Click here to sign up TODAY to get the April kit! Don’t forget that Thursday is the last day to get in the Ink Pad Giveaway!!! Click here to learn more and click here to start shopping with the Hostess Code: FCCVREYF. I can’t wait to draw the winners name on Friday!!! I’m so excited!! The base for this box is Clear Tiny Treat Boxes which come with 16 in the pack! For the inside decoration, I used some of the Sending Love Designer Series Paper. I cut it into a 2″ x 6″ piece and scored it just a smidge over 2″ and then from that score line a smidge less than 2″. The reason for this is because the box is 2″ so when you score at exactly 2″ it is kind of tight in the box. I placed the paper into the box and added the chocolate treats. Yum!!! 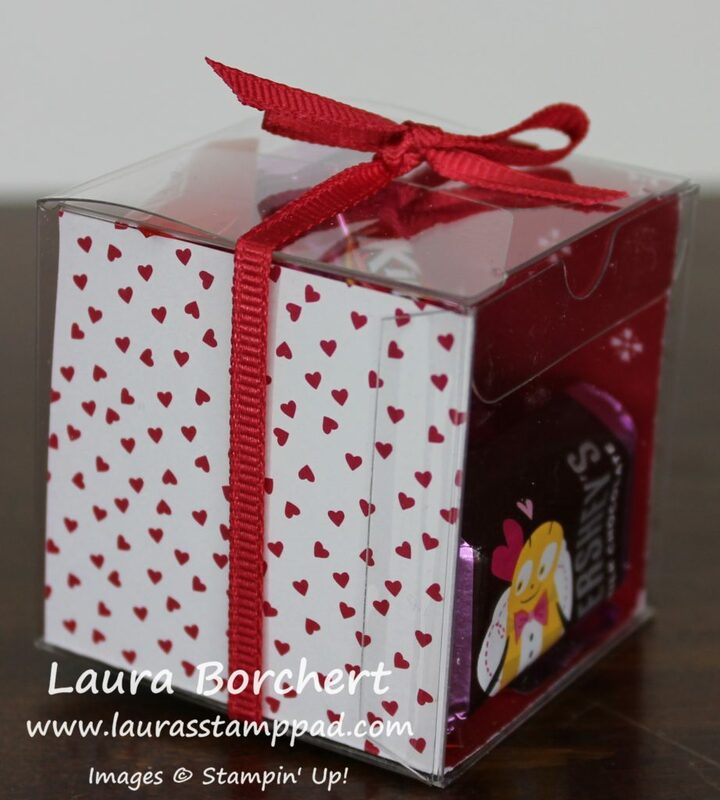 I added some ribbon around the box and tied it into a box using the Sending Love Designer Ribbon which comes with both white and red ribbon. This is perfect because then you can really mix and match with the different designer paper patterns! I left mine without a tag because I will be passing them out to various people – friends, family, and people I see all week this week at the grocery store, Post Office, etc. 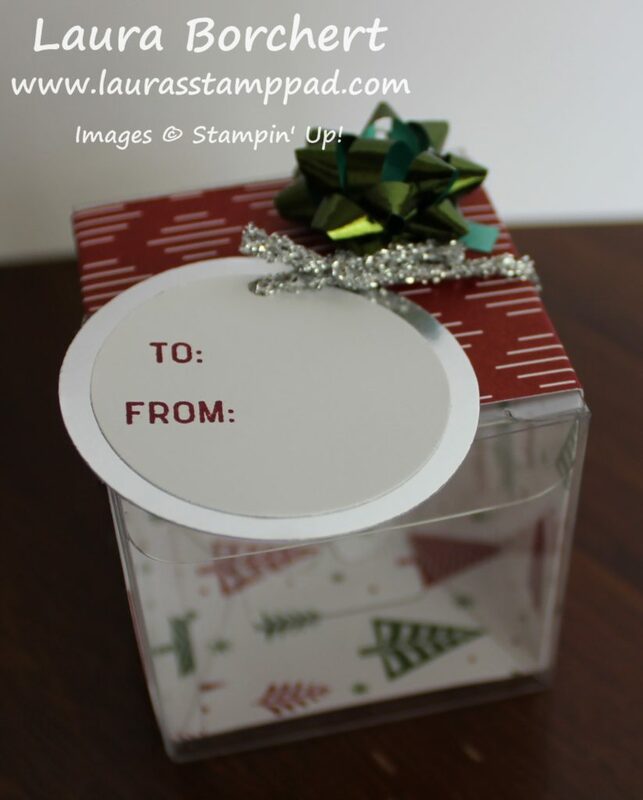 You could always add a tag using your favorite stamp set that has hearts or a To:/From: or you can use the fabulous Sealed with Love Stamp Set! 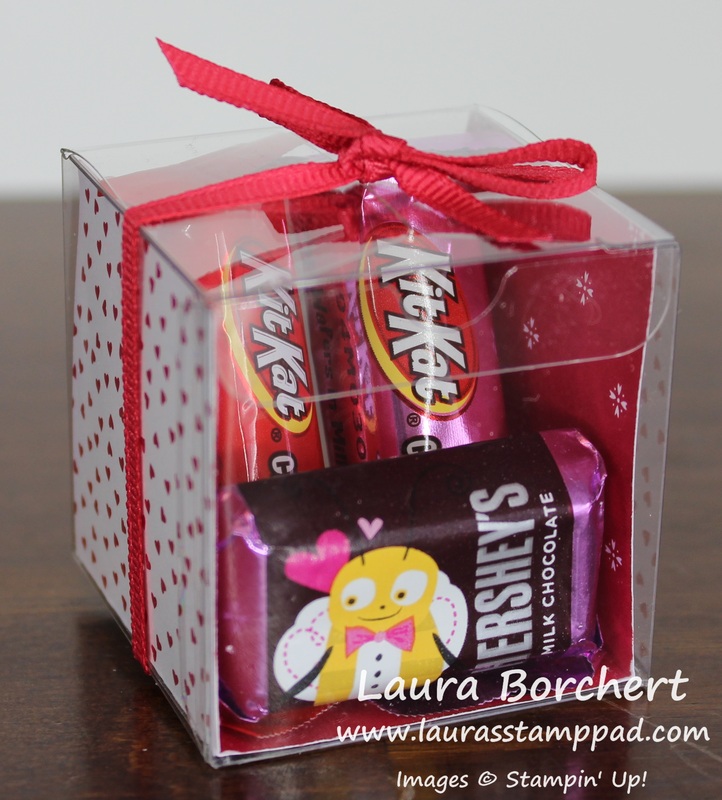 Do you make Valentine’s Treats for your kid’s classroom, friends, family, or strangers?? Let me know in the comments below!